In limited release right now, T.C. Johnstone’s Rising From Ashes documents the struggle to establish a competitive cycling program in Rwanda. Cycling is hardly the first thing you associate with thoughts of Rwanda, but as this film reveals the sport’s rise in the country has provided a vehicle for hope. 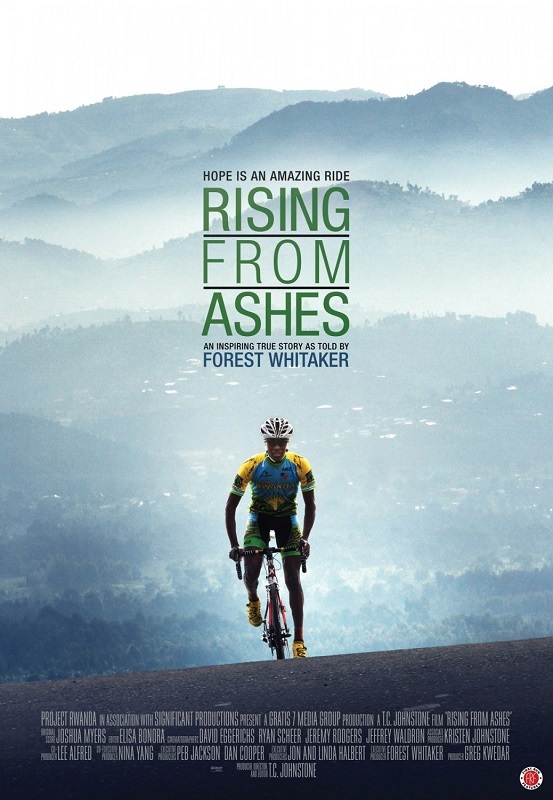 The film follows the formation of ‘Team Rwanda’ in 2007, and the trials of the team’s young riders as they compete in Rwanda, the USA and at the London Olympics. The stand-out star for the team in this period was Adrien Niyonshuti, who became Rwanda’s first professional cyclist with his move to MTN Cyling in 2009. The film assumes no special knowledge of the 1994 genocide and at one point it departs on a history lesson to bring the audience up to scratch. There are inevitable problems with providing quick overviews to historical episodes on the scale of the Rwandan genocide, but Johnstone gets it about right here, revealing the seeds of genocide in the legacy of imperialism and providing the context in which the subsequent stories of struggle are recounted. The interviews with Adrien and his team mates, who were children at the time of the genocide and who each suffered tremendous loss, reveal cycling’s potential as a source of healing and unity in the long aftermath of the tragedy. Having some initial success, Adrien and the team also have to meet the challenge of their communities, who are not always sympathetic. Standing opposite Adrien’s story is that of the team’s coach – Jock Boyer. Boyer, the first American to race the Tour de France, made a serious error of judgement in his personal life after his pro-cycling career and on multiple occasions his place in Rwandan cycling is described as a ‘second chance.’ Boyer’s experience in Rwanda is part of morally complex and personally intense journey, with this intensity revealed in his relationship to Adrien. The unusual dialectic, between Adrien’s hope and Boyer’s intensity, is synthesised in the opportunities which emerge for Team Rwanda over the course of the film. The film also touches on the broader problems of western development in Africa, wherein many NGOs fail to empower the self-activity of the communities they operate in, resulting in the failure of their programs when they depart. Whilst the problem is discussed with Boyer’s assurance that he is in Rwanda for the long haul, an important recent development is missing from the film: in August last year Adrien Niyonshuti succeeded in establishing his own cycling academy, perhaps marking the sport’s evolution to independence from western support. The story is serious and touching, but there are lighter moments too: the rider’s transition from decrepit equipment to new working gear is related with some funny incidents; the good humour and camaraderie of the team is a constant, and Jock Boyer’s animal-whispering rapport with a motley menagerie he keeps is cute. Cyclists will get a lot out of this film (as a racing cyclist I found myself wishing they’d get some form-fitting jerseys sooner – come on, watts!) but like the trailer suggests, it isn’t a prerequisite to enjoyment. The story is moving enough to appeal widely. Rising From Ashes is showing at Nova here in Melbourne (heads-up – it’s in the tiny cinema seven, with no allocated seating, so get in early for a good spot).